The Ancient Villages in Southern Anhui - Xidi and Hongcun are two exceptionally well preserved traditional Chinese villages from the Ming and Qing Dynasties. Their townscapes are developed in harmony with the natural environment, using the geomantic principles of Feng Shui. The Huizhou style is the predominant architecture in the villages: white walls, dark tiles, horse-head gables, stone drums or mirrors and open interior courtyards are common features. It was the style favoured by the local merchant class. Xidi and Hongcun can easily be reached from Huangshan City. Until quite recently, foreigners required a permit when visiting this region (and especially the little villages). This has been abandoned now so it seems, at least I wasn't bothered. Transport is abundant too. I was on my way to the busstation to take a bus to Yixian from where minibuses are leaving to both towns, when I was 'highjacked' by a taxi driver. The friendly guy offered to drive me around for the day, and we quickly agreed on a price. The drive from Huangshan City takes about 45 minutes and is a pleasant one through the hilly and rural landscape of Anhui. We first stopped at Xidi, where 124 traditional houses remain. Especially near the entrance of the village every inhabitant seems to have opened a souvenirshop, which is a bit annoying. The highlight of the village is behind you then already: a great three-tiered stone arch. The village is bigger than you'd expect, and one can easily spend 1,5-2 hours here. Besides the ubiquitous Chinese tourgroups, I met many highschool students painting the street scenes. Lots of local people were doing their laundry in the waters running through the village, probably taking advantage of this wonderful sunny day. Hongcun, about 15 km away from Xidi, has several of the same features as Xidi but distinguishes itseld by its pools and narrow streets. I found it a bit difficult to navigate here, the town has a strange shape (like a water buffalo, the Chinese say). But eventually I reached the Moon Pond, a crescent-shaped pool surrounded by houses. What a great spot! I immediately decided to make this the place to unpack my lunch and just sit here for a while. 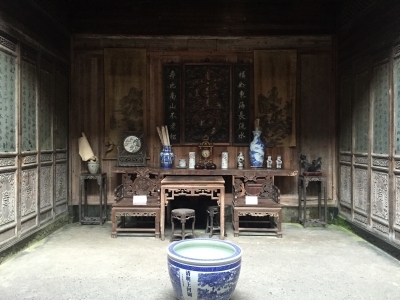 There are also a number of large houses open to the public in Hongcun. I was surprised by their lavish interiors. Carved wooden beams are the main feature here, which is so different from the whitewashed stone exteriors of these houses. Both Xidi an Hongcun charge an 80 Yuan entry fee (8 EUR), and sometimes one has to pay a few Yuan extra to take a look inside a house. It is worth visiting both, though I found Hongcun the more picturesque and quiet one of the two. I visited Xidi and Hongcun in 2017, around the time of Chinese New Year. Both sites were thus very crowded - but on the plus side, most houses were decorated with red "chunlian" banderoles on each side of the door, which enhanced the experience in the otherwise very much black-and-white looking villages. Both villages are the most representative villages of the traditional region of Huizhou (where the "hui" part of the name of Anhui province comes from), and are just two of many. The region overall is more or less equivalent to today's Huangshan prefecture and somewhat off the beaten track - but during the Ming and Qing dynasties it was a centre of literati and brought forth many court officials. It was these latter who - once retired from officialdom in Beijing - would build the exquisitely decorated mansions in their home towns in Huizhou. Particularly renowned officials would even be awarded a "paifang" by the emperor - a ceremonial gate, such as the one at the entrance of Xidi. Xidi, Hongcun and their neighbouring villages were thus relatively wealthy villages, and their architecture is far more elaborate and polished than what would be expected of "vernacular" architecture. In general, the buildings display a pretty plain exterior, which contrasts with extremely ornamented interiors - in particular the interior open-air courtyard which was used to receive guests, where no wooden beam or panel is left undecorated. In addition to wood carving, stone and brick carving are typical of Huizhou architecture, and are also well represented in both sites (in particular in the entry gates of the mansions). These houses - both the main mansions as well as the more intimate houses of lesser families, many of which are still inhabited - were for me the highlight of both sites. What distinguishes both villages? 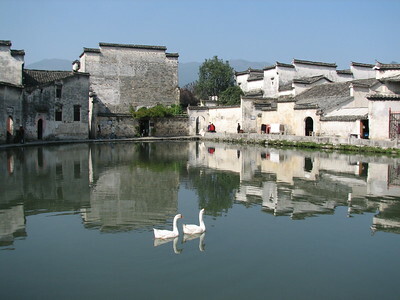 Hongcun's Moon Pond is certainly picturesque, and its mansions grander, but Xidi overall felt more homely. It's definitely worth visiting both (they're pretty close to each other anyway), and a great addition to China's WHS list beyond the more well-known imperial or religious architecture. I disliked both villages. I came with a tour from Huangshan which is very popular. I found that now that visitors are coming the locals make this into a tourist trap, selling overpriced vegetables and herbs and making them seem special. I walked around the villages twice in the hope to see something special but in the end all I got were farmhouses and farmers working on the fields, washing clothes in the dirty water. If I wanted to see that maybe I could go to Romania too? Once I saw everything the tour guide said we spend another hour here for "shopping" - how frustrating! For people who think China is all developed because of its economic standing in the world: most of it is still farming. So if I get to farm villages with some traditional housing it isn't special. You can see that in a lot of places. It maybe is not protected or in a good state but that doesn't make it worth seeing. Elite metropolitans maybe think it is something they have never seen before. Xidi and Hongcun are precious gems, getting there is fun! We had our own rented minivan, and left Huangshan very early. We passed the countryside covered in mist and bamboo forests, it looked like Switzerland with the river, the black-and-white ancient villages! I wrote this in the Huangshan section, but it's worth repeating. Try visiting some of the other villages enroute to Hongcun and Xidi, they are quite similar in style, minus the commercial atmosphere. Having said that, I know that our group blends in with the local Chinese backpackers, so we never have problems with permits. I'm not sure if you don't look Chinese if there's a way around this. My wife and I visited Xidi and Hongcun in January 2002 as part of our visit to Huang Shan. We both really loved the villages, as we do everything in China. They have been well-preserved, and what was so amazing is that people actually still live there, surrounded by tourists. It was far better than seeing an empty shell, even though many wanted paying for their photos to be taken! But then, how else can they make a living? I didn't mind that. A visit here is thoroughly recommended, but be careful if you go outside the normal tourist dates - you have to get a police permit to enter the sites, and it took several hours finding the office and rousing up someone who could arrange the permits.